Half Past October: A Review Of Customer Service: AKA Who Does It Best When You've Been Done Wrong? A Review Of Customer Service: AKA Who Does It Best When You've Been Done Wrong? The most depressing thing about k-beauty is having to wait on your beloved treasure-trove of products because a majority of the products come directly from Korea. Sure, more and more retailers are popping up in the US and in other parts of the world, but how reliable are they? How easy are they to work with? This isn't a typical "I had a bad experience" blog post. No, this post is going to highlight some recent customer service experiences, both good and bad - explaining why I had to contact customer service, what they did or didn't do to resolve it, and if I would order from them again. Ready? Ok! Memebox is like a treasure in my soul. Lots of people have had issues with their packages when they were still shipping from Korea, but I was lucky enough to never have a problem with those bright pink boxes flying half way around the world to get to me. Until they started shipping from within the US, that is. Out of my most recent two boxes I've had to contact Memebox about an item in each box. Firstly, I received a cushion with no product in my "Korean Makeup Starter Kit" box, which was both surprising and disappointing since the cushion was the main reason I ordered the box! I posted photos of the empty cushion in my review. How did Memebox handle this? They sent me a new cushion! Good call, Memebox, because I loved this cushion so much I ordered another after actually getting to try it! Secondly, I received a serum instead of an emulsion in my "Winter Skin Revival" box - which wasn't all bad, but I've been in the market for an emulsion and was kinda bummed that I didn't receive it. 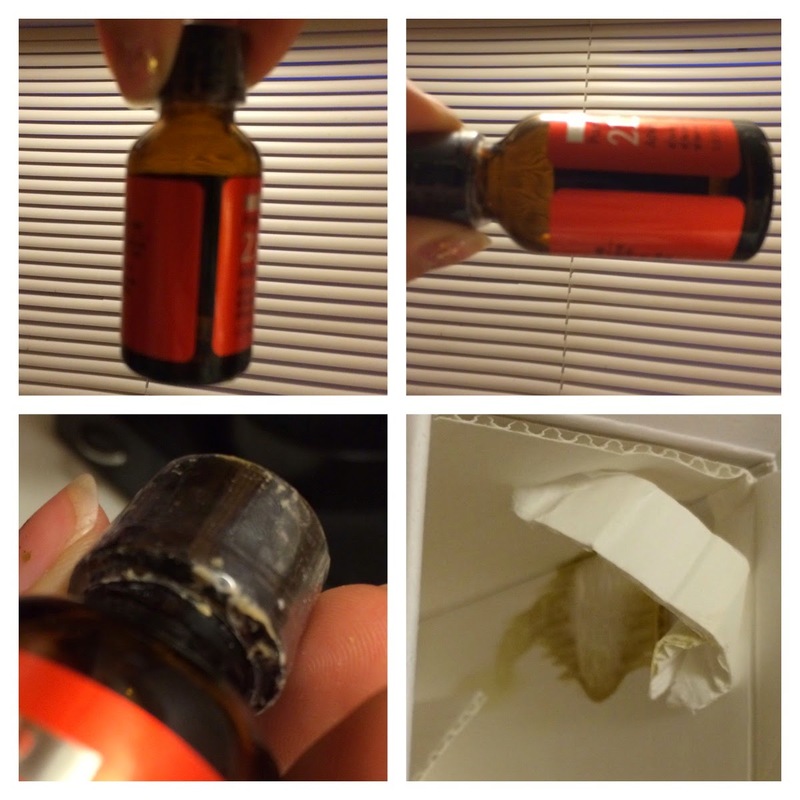 You can see the serum I received, and info about the emulsion I should have received in my review. I contacted Meme to let them know, and they sent me out a bottle of the emulsion! It's difficult to see because they're so tiny, but my Benton Snail Bee High Content Skin is full of tiny floating bits. 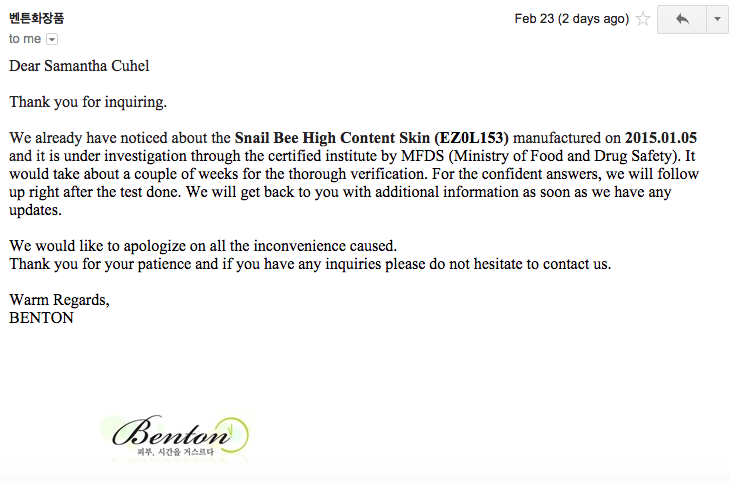 Since Benton likes to keep their products more on the natural side, I'm afraid (as well as others who have been experiencing this same issue) that a batch of product has been contaminated. I contacted both Memebox and Benton on this one. Memebox issued me a $10 refund to cover the cost of the toner in the value set. Really Benton? Where's the announcement to hold off use until you can investigate? After this latest debacle, I'm most impressed with Memebox and will most definitely continue to purchase from them when I have points or they have a good value set/box available, but Benton has turned me off from purchasing more of their products with their lack of customer awareness and consideration. Next up we have Amazon. Amazon isn't a k-beauty retailer, but I buy a lot of my beauty products from them because I have Prime - so when I find what I want I can usually find it being distributed by Amazon and get it in two days. I've been buying from Amazon for years, and never had issues until the past couple weeks. I'm not sure what it is, but it's been pretty depressing to be honest, when it's almost every order you place! Firstly, was an order I placed for a new Missha serum and other moisturizing goodies. This was an expensive order. I watched FedEx drive down my road, then turn around in the cul de sac, and drive back off my road. They stopped once at the end but not anywhere near my home. I checked Amazon to see what the delay was for my package and it was marked as delivered. I bundled up and looked around outside, nothing. The package was not delivered. A call to FedEx proved uneventful, but Amazon took care of me. After the package did not arrive over the next 24 hours, Amazon issued a full refund for my order even though FedEx marked it as delivered. Kudos to you, Amazon, for saving this mom's sanity. Secondly, was an order I paid extra for one day shipping with a Saturday delivery on. I actually needed supplies for an art assignment, and wanted time to work on it over the weekend. Saturday came and half way through the day the package still hadn't arrived. I checked my tracking to find a delay due to weather and that my package wouldn't arrive until Monday. I can deal with that, but what about the extra money I paid for shipping? Sure, weather is unpredictable, but I'm not paying for services I don't receive. Sorry! No worries for me though, Amazon refunded the full cost of the shipping I paid (since it was a Prime order, it would have been free for me to receive it Monday anyway). Finally, is my newest Amazon order and probably the most confusing one for me. I placed an order on February 20th with an expected delivery date of February 24th. The longest I've ever waited on a Prime order but I didn't need it right away so I wasn't bothered by it. Tuesday came and went and the package never arrived, and the delivery date never updated saying there was a delay. Great. I contacted Amazon the following morning to find that my package had been returned but with no reason as to why. It never made it to my state, so I know it wasn't mis-delivered or something strange like that. My best guess is that UPS damaged my package somehow and returned it to Amazon instead of delivering it to me - in which case I'd be grateful that they eliminated a lot of work for me. However after contacting Amazon, they have no idea why the package was returned to them. Amazon put in a refund request for me on 2/25 and I received the refund on my card a few days later. They will definitely have me as a repeat customer. Our next retailer is Beauteque. Beauteque is a smaller company, started by a high school student with a small bit of help from her mother. I have heard of Beauteque in the past, and almost ordered some of their amazing BB Bags and they now have a mask subscription service too! They really do seem like a fun company to order from with a lot of nice new ideas popping up often. My first order from them was just a toner. 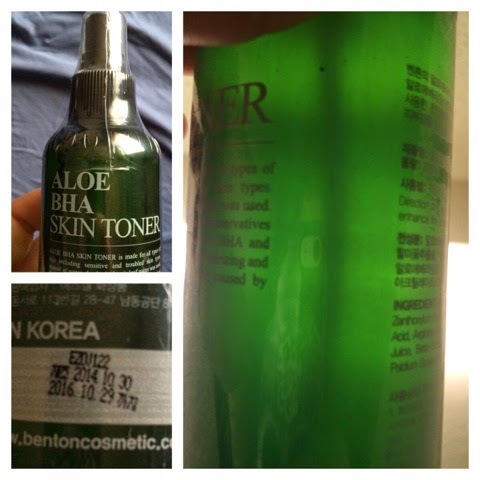 At this point I was still waiting on the Benton Value Set from Memebox mentioned above and I had used the Benton Aloe BHA Toner in the past (was currently still using it at the time of ordering actually) so I bought a bottle from them when it was on sale. This toner is generally lightly cloudy in nature due to the BHA, but if you look closely you can (hopefully) see what I can see in person. I immediately contacted Beauteque when I received the toner on 2/13, and they responded later that night after I posted that I had emailed them on their Facebook page. I replied to their email immediately and never heard back. *UPDATE* I opened up a PayPal dispute on 2/25 after remembering I used PayPal to pay for my order, and instead of receiving an email or any type of response I received a refund on 2/26. 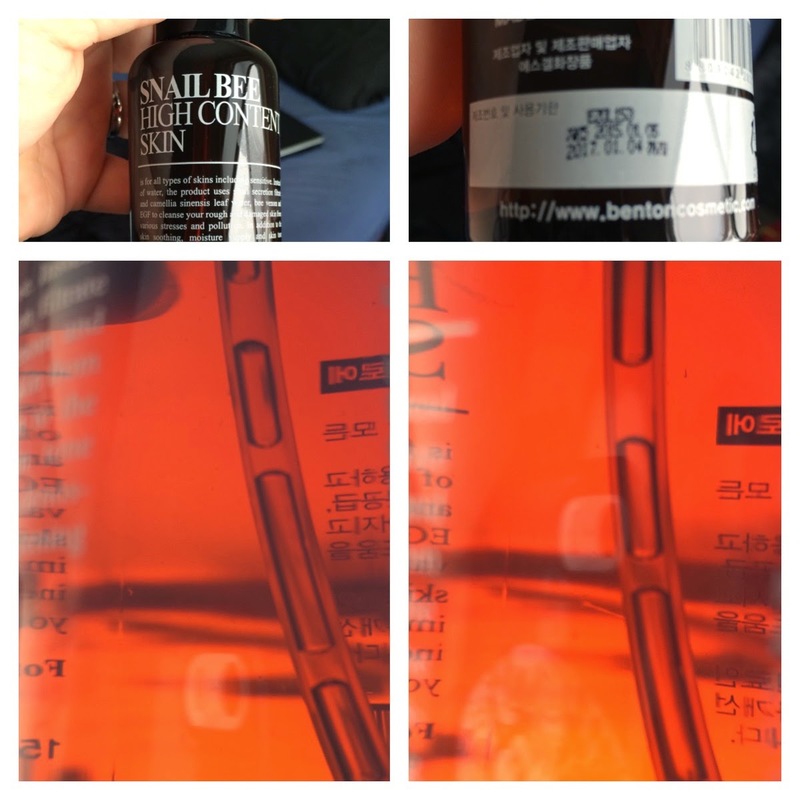 I just recently wrote Benton about this, and they responded telling me that the black chunks I can see inside my toner are actually air bubbles. I'm pretty sure the bubbles that look like bubbles are actually air bubbles, but I guess I'm not qualified enough to distinguish bubbles from specks. Benton has assured me that the toner is safe to use - but this stuff is going no where near my face, it's now in the trash. I refuse to spray mold on my face due to the negligence of a manufacturer who doesn't want to admit another potential error. As for the spray nozzle - they have brought back the old spray nozzle because they are concerned about the product going bad or getting contaminated from their bottles opening each day and being exposed to air. Are their products really that touchy? I admit, I feel a bit wary about ordering from Beauteque again after all this. I know an issue like this is out of their control, but I am disappointed about their customer service team not being able to respond to me. I am happy to have gotten my issue resolved in the end, but I didn't want to have to file a claim with PayPal to do it. As for Benton... I think I am done with their brand after this. What a waste of money, and the potential danger to customers skin? No thank you. Last up is Wish Trend. An empty vial is what I found. But the tiny spot on the box without a pool of product in the package leaves me to believe that this didn't leak during transit to me, but before it was even shipped. I contacted WishTrend and they responded within 24 hours asking for more pictures (I actually think that the first ones I attached to my message didn't send correctly, because they weren't in the response I received) which I promptly sent back to them. I am currently waiting to hear back from WishTrend about this issue, but their initial quick response is a good sign. I will update here as soon as I hear more, or if I don't! UPDATE: Wish Trend has sent me a replacement serum that arrived perfectly! Thank you WishTrend for the amazing service! I hope this post is helpful is some way to some of you. My experiences are simply just my own, and are no reflection of how a company runs as a whole - but I hope that my simple experiences can give you some insight on how certain company's handle situations better or worse than others, and maybe give you some insight on where you should order from next. Disclaimer: The Glitter Chic blog created this post of past purchases for the purpose of review and evaluation. No monetary compensation was received for this post. The Glitter Chic blog will always provide honest opinions, beliefs or experiences on products reviewed. If you have any questions, please contact me at gothickornchic at gmail dot com. This blog contains affiliate links. The Glitter Chic is not responsible for prize delivery. The disclosure is done in accordance with the Federal Trade Commission 10 CFR, Part 255 Guides Concerning the use of Endorsements and Testimonials in Advertising. I absolutely agree, which is why it saddens me so much that I got (not overtly obvious but still there) backlash as of last week for being a Benton "hater" (which I am not). Oh well, I guess they don't want to believe that there is anything wrong now either even though Benton clearly admitted to it.